From a historical perspective, Lesotho, barricaded by the Maloti mountains and entirely surrounded by South Africa, resembles the eye of a hurricane. From Basutoland’s emergence as a single polity under paramount chief Moshoeshoe, until the proclamation of an independent Lesotho in 1966, throughout the tempestuous cycle of migrations, land-grabs, massacres and wars of the nineteenth century, and the dark times of apartheid during the twentieth, the little mountain kingdom has survived with its cultural integrity intact—making for a unique travel experience today. Recently, the Maloti Drakensberg Transfrontier Programme, in partnership with Volkswagen South Africa, the Maloti Drakensberg Route, Boundless Southern Africa and the Lesotho Tourism Development Corporation, staged a 4x4 adventure tour of Lesotho’s lesser known southern region. Explore magazine reports. The hospitable town of Matatiele, Eastern Cape province, is the gateway to southern Lesotho. The most direct route is via the Ongeluksnek Pass, so-called because of a fatal ox-wagon accident that befell a party of Griquas heading for Kokstad in the 1860s. Rutted and vertiginous, it’s not an easy drive at the best of times (low range all the way). Rain or snow can make the going impassable to all but the most experienced 4x4 drivers. On this occasion, the gods gave a half-smile: the pass was veiled only in mist until the top, at 2555m above sea level. Then, suddenly, the going levelled out along the shores of Lake Letsie, a fishless alpine lake named after King Letsie II and known to freeze over in winter. As the mist began to dissipate, a sound spread softly through the air: the characteristic ringing of sheep bells, announcing the fact that we had really arrived in Lesotho. Presently, as though proceeding in a pageant, a pair of young shepherds in blankets, patchwork trousers and gumboots drove their flock of lambs along the roadside. A completely unremarkable event in a country where sheep are an indispensable part of a largely subsistence economy, yet somehow very touching to a member of the modern world, for whom shepherds are more closely associated with Arcadian myth than a lived reality. 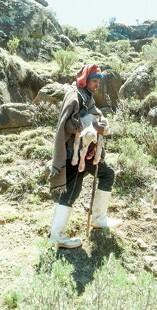 Then, as though to accentuate this mythic undertone, another shepherd came walking and playing a two-stringed instrument of his own device: a compelling, hypnotic rhythm no doubt of considerable assistance to someone walking every day with sheep for distances at which the most hardened trail-runners might balk. From Ongeluksnek Pass, the road snaked through Maphooaneng pass and on to Semongkong Lodge. From the passenger seat, I started drinking in what is easily the most extreme mountain landscape I’ve ever seen. It’s the elevation that makes the difference: from 2555m above sea level, the eye floats from one mountain range to another, to another, to another, separated by serpentine water-courses more like chasms than gorges, connected by gargantuan shattered rock plateaus. The effect is of indescribable geographic antiquity, so much so as to induce a sense of temporal vertigo to go with the ordinary vertigo produced by looking down from a car window at a sheer slope that just keeps going down, and down, and down … This heightened sense of unreality, of “this is so amazing, it just can’t be true” is central to the Lesotho experience. At the same time, this lapidary leviathan of a landscape is alive from top to bottom. The shepherds and their flocks are joined by horse riders swathed in colourful blankets, mounted on the famed sure-footed Basuto ponies introduced by Moshoeshoe I to give his people a fighting chance against the Koranna, Boers and other marauders; only the occasional cell phone casually consulted mid-trot betrays the presence of technology. Donkeys abound, often seemingly unaccompanied, trusted to deliver sacks of maize to their destination through force of habit. On closer inspection, the mountains, too, are marked by human hands: terraces are cut by hand into the slopes and ploughed by oxen, ponies or hand for the cultivation of crops. The villages themselves harmonise with the mountains, being mostly composed of round stone thatched huts spread out in family groups. Sometimes a pole with a colour-coded pennon will signify that vegetables, meat or beer are for sale. It took the best part of a day to drive from Matatiele to Semonkong Lodge, which, after 211km of steep gradients and bone-jarring roads, was greeted as an oasis in the stony wilderness. For the traveler who prefers a modicum of convenience as well as a range of experiences that don’t have to be worked for too hard, but are breathtaking for all that, Semonkong (“Place of Smoke”) is a must. Situated on a rocky slope overlooking the lMaletsunyane river (birds swoop in and out of their nesting places on the rock face opposite), and surrounded by huts and sheep and cattle pens (bells rang far and near), the lodge offers comfortable accommodation (no electricity, but hot showers), good food served in a convivial restaurant and bar, and superlative activities. The Maletsunyane Falls (the “smoke” from which Semonkong takes its name), accessible by horseback, foot or 4x4, is a waterfall that plunges from a basalt ledge to a basin 192 metres below, creating a reverberating echo attributed by local legend to the wailing of the souls of the drowned. But why walk to the bottom when you could abseil? Semonkong Lodge operates the 204m Maletsunyane Abseil, which has the distinction of being the longest commercially operated single-drop abseil in the world, with a Guinness World Record Certificate, received in October 2005, to prove it. Fancy an exposed straight drop, suspended in mid-air, surrounded by waterfall spray, encircled by curious or indifferent birds? Qualified guides ensure you live to tell the tale. Thamathu was something special. A group of local residents had clubbed together to form a homestay programme; this was their first opportunity to welcome travellers to their home. A feast had been prepared, with a full spread of local fare accompanied by singing and dancing. Later, we were guided to our accommodation, where we would be given breakfast before setting off again. To me, this was the most privileged moment of the whole trip. Not everybody in the group appreciated the local fare (boiled tripe, mutton ribs, sheep trotters, spiced cabbage, pap, chicken, and, pièce de résistance, a “smiley” or boiled sheep’s head, washed down with traditional beer), and some commented that the cuisine would have to be upgraded a notch or two for the convenience of future tourists; I would argue that this would detract from the authenticity of the experience. (Yes, I had some of everything.) However, to wake up after a good night’s sleep in a warm hut, as the beasts began to stir and the people set about their day, to share the family’s space for breakfast (best cup of tea I’ve ever tasted, brewed on the dung-fired outdoor stove), brought me closer to a sense of the Basuto mountain people’s lived reality than anything else. Unforgettable. After Thamathu, Sehlabathebe (“Shield of the Plateau”) opens up a world of grasslands studded with mesmerizing metamorphic rock formations and rock pools. San rock paintings distributed across 65 rock art sites remind you that the human footprint in this part of the world extends back 40 000 years, while the occasional patch of lightning-scorched grass reminds you just how high up you are. 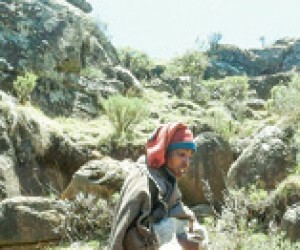 Home to a range of unique Afro-Alpine plants (23% of the plant species in the entire Maluti Drakensberg area), mammals, birds, reptiles, amphibians and fish, Sehlabathebe’s 6500 hectares are also the last remaining habitat of the critically endangered Maloti minnow. Walking through Sehlabathebe, you can entertain momentarily the notion that the world outside has ceased to exist. Driving back to Matatiele, it became evident that, in some sense, Lesotho’s isolation is its salvation. Isolated villages become ever less isolated until they merge into small towns, which give way to larger towns sprawling across many hectares. The rural lifestyle is still there, colourful traditional garb, cattle and all, but it’s complicated by pressures – and economic opportunities – to which the people of southern Lesotho are, as yet, not subject. Who knows what the future will bring?